Because you can communicate with nearly 500 million people around the world. Because Spanish is the second most-widely spoken language as a mother tongue in the world, after Mandarin and before English, and the third most–used language on the Internet. Because it is the official language in 21 countries, with around 350 million native speakers. 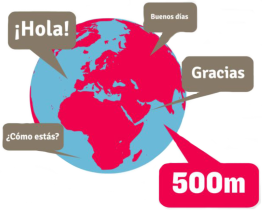 Because 52 million people already speak it in the USA, which will have the largest Spanish-speaking population in the world by 2050. Because in Europe (not including Spain) approximately 30 million people can speak Spanish. Because Spanish is on the rise in Asia (around 20,000 people study Spanish in China, and where the Instituto Cervantes in Bejing has doubled the number of students every year since it opened in 2006). Because it is the second most-used language for international communication in the world, apart from being one of the six official languages of the United Nations, along with Arabic, Chinese, French, Russian and English. In the world of business Spanish is highly-valued by companies, so that greatly increases your job opportunities. Enjoy a new way to learn Spanish! «It is‭ forceful, creative, modern… A language that unites people from different countries and one of the most dynamic languages in the modern world…».